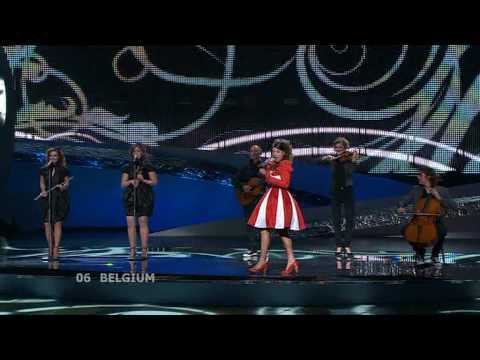 Belgium takes part in the Eurovision Song Contest since the first year 1956. The biggest success war Sandra Kim’s victory in 1986 with “J’aime la vie”. In 2006 Belgium’s most popular artist Kate Ryan was send with a Smash Hit “Je t’adore”, but failed unluckily in the semifinal. As the country has two main parts Wallonia and Flanders with two languages French and Flemish, Belgium rotates with the choice for representation at the Eurovision Song Contest. This year the Flemish part had the chance to choose a song for Belgrade. But the Song “O julissi na jalini” is neither Flemish nor French. It’s a fantasy language, like Urban Trad used in 2003 and they came second! If you first listen to that song you will be surprised. It’s totally different from all the other songs this year. There are many gimmick songs, but this one is probably the best and most outstanding. It’s a fresh melody, a little nostalgia of a carefree childhood. This song is so unusual that it could be the one, which is going to be played all over in Belgrade: in discos, in cafés and bars – it follows you everywhere. A top candidate!